Introduction of the new enhanced MDB interface for vending machine applications. This new range of devices replaces the current devices and offer new features. - Compatible with all computer operating systems supporting USB like Windows XP / 7 / 8 and Linux. - The interface apears as virtual serial port when connected and communication with the PPP protocol like a generic modem device. 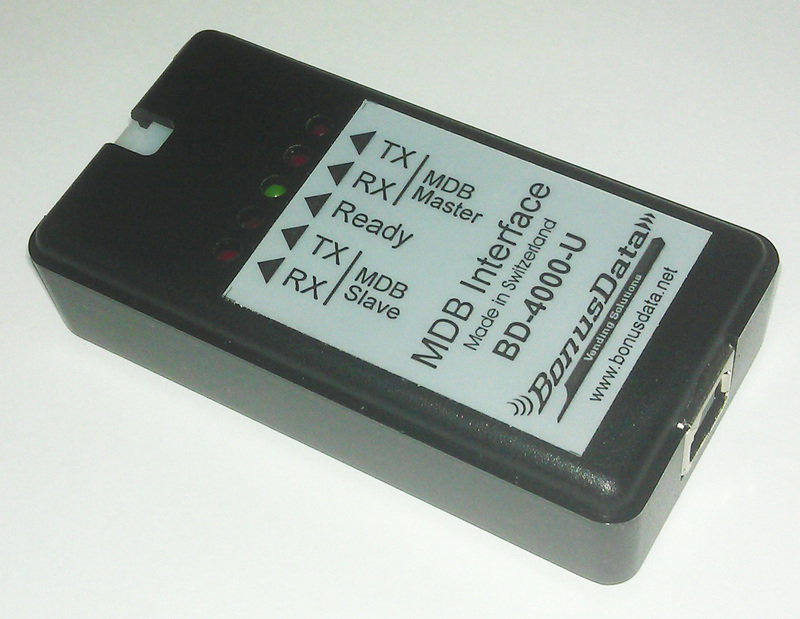 - The MDB interface can be either used as serial data analyzer or as interface between vending devices and computer. - Three devices, the BD-4000-U with USB interface, the BD4000-S with a serial RS-232 interface and the BD-4000-E with an ethernet interface. Recording MDB communication with MDB/USB Interface and ESDA.EXE application. Analyze previous recorded MDB data files. Technical manual with installation instructions. Technical Manual for ESDA Software Application. USB driver script BD-4000.INF to support the installation of the the USB communication. Analyzer application software ESDA V04.11 for Windows operating systems. Firmware version V01.17 for the BD-4000-U/S/E device. Programming Manual for the BD-4000 Applications with Echo protocol. Sample Source Code to Communicate with the BD-4000-U or BD-4000-S over the ECHO protocol. Raspberry Pi 3 Model B Image with ECHO protocol 2017-01-11-raspbian-jessie.